The WSM have produced an article that puts in context the way the Palestinian land has been stolen from them by the Israeli state. For the size of its population Ireland has seen very large Gaza solidarity demonstrations. It is also one of the few places in the world outside the USA where there has been public displays of support for the Israeli military assault. Internationally there are many variations of this map where activists present to their population what the expulsion of the Palestinians from much of the land they once occupied would look like in a local context. One of our members prepared this but we soon realised its an impossible image to post without some reflection on our own settler colonialist past. A version of this map could have been produced based around a historical ‘what if’ alternate development of Irish history. The obvious parallel is the partition of Ireland, what if the 1968 Civil Rights movement in the north and the war that followed had led to a hyper aggressive military response from an overwhelmingly powerful unionist state. In that history the burning of the British embassy in Dublin in the aftermath of Blood Sunday along with the supply of arms across the border is used as an excused by a northern statelet with overwhelming military superiority to launch a full scale invasion. The southern states armed force’s are quickly crushed and much of the south is occupied down to Dublin, and across to the Shannon. 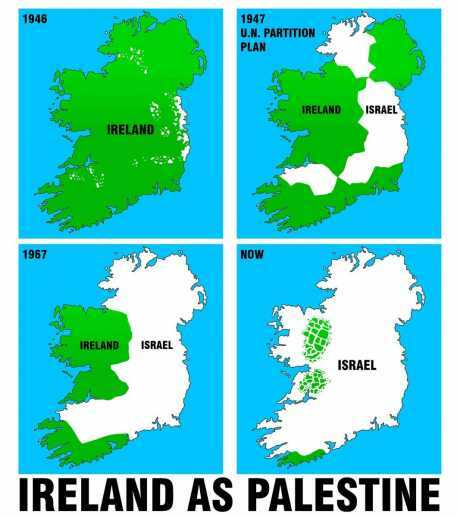 Dublin is partitioned just as Jerusalem is today, and the vast majority of the nationalist / catholic population flee in the face of a terror campaign against them. Many leave Ireland altogether together and generations later their children still remain trapped as stateless refuges in camps across Europe. A settlement program comes into being where anyone who can demonstrate a historic link to Presbyterian migrants from the north (huge numbers left for the America’s in the 1770’s) is encouraged to return to their ‘homeland’. On arrival at the airport they are given full citizenship and through formal and informal mechanisms encourage to establish themselves in rapidly expanding fortified settlements in the south and west of the Shannon. Any form of resistance to this is ruthlessly crushed and used as an excuse for further fortification and partition. As the years pass the nationalists in the west find that most of the economically viable land is taken off them and they are left with the bogs, but even these are cut into small segments separated by ‘settler only’ roads. It’s much worse in the south where all the fertile land is taken except for a tiny strip of West Cork where the entire nationalist population is herded. A wall is built and this becomes a vast outdoor prison where even fishing boats are regularly attacked if they venture out from the coastal strip. Anyone familiar with Irish history will know that something like this was actually attempted in the 16th and 17th century by the British crown. It led to a period of resistance, massacre and viscous warfare, with each side being armed at times by powerful external forces engaged in wider European conflict. That very crude parallels probably account for why some Ulster loyalists have been flying Israeli flags and ‘Bomb Gaza’ signs appeared in some parts of Belfast. There was what is termed a ‘settler colonialist’ model in Ireland. Indeed the Irish experiment in the 1600’s was not only used as the basis for the similar process that was used in the America’s many of the same characters (like Sir Francis Drake) first tested methods here before using them in the US. But in Ireland their experiment failed and one of the reasons it failed should give us hope as it failed because of a real movement for radical democracy. The 1790s in Ireland saw a key part of the settler population reject the cycle of sectarian feuding and instead initiate a project of radical democracy aimed “To unite the whole people of Ireland, to abolish the memory of all past dissentions, and to substitute the common name of Irishman, in the place of the denominations of Protestant, Catholic, and Dissenter” No longer did people seek alliances with whatever European kings happened to favour their religion but rather they reached out to movements that shared their radical democratic agenda, including movement in Britain. Later on at the key moment of the ‘War of Independence’ Britain did have overwhelming military force but the British ruling class were fearful of revolution at home, so fearful that at the end of World War One they had battleships in London and on the Clydeside ready to put down revolt. The radical democratic movement of the United Irishmen and later the Irish Citizens Army did not win their program but they were very much part of the story as to why, although our history might parallel the history of Palestine, it is also very different. So if this map suggests the potential grimness of a imaginary parallel ‘Palestinian solution’ imposed on Ireland the reasons why that is not how things turned out should be a cause for hope. And for understanding why both international solidarity and resistance from Israeli’s is key to the process of creating a hope that can destroy the rotten settler colonialist project of the Israeli state and its sectarian program.